Murphy. D., Morgan, S., Celik, S., Retzlaff, W., 2018, “Evaluation of a Residential Green Roof System for Storm Water Runoff Retention”, Journal of Living Architecture, 5 (1), pp.16-30. Al-Yaseri, I., J. Zhou, S. Morgan, and A. Bartlett. 2017. “Initial Impacts of Rain Gardens’ Application on Water Quality and Quantity in Combined Sewer: Field-Scale Experiment.” Frontiers of Environmental Science & Engineering, 11(4): 19, pp. 1 – 12. Morgan, S., I. Alyaseri, and W. Retzlaff. 2011. Suspended solids in and turbidity of runoff from green roofs. International J Phytotechnology. 13:179-193. Karanam, H., Retzlaff, W., Morgan, S., and Celik, S. (2013). Experimental and Theoretical Analysis of Evapotranspiration in Green Roof Systems. I. Dincer et al. (Eds. ), Causes, Impacts, and Solutions to Global Warming (pp.1055-1066). New York: Springer Science+Business Media. Morgan, S., J. Zhou, B. Retzlaff, D. Wilson, R. Witt, and S. McCrary. “Public and Private Partnerships to Adopt Green Infrastructure for Managing Urban Stormwater.”  2016 International Low Impact Development Conference Proceedings. Beijing, China. June 2016, file 97. Bloorchian, A. A., J. Zhou, S. McCrary, R. Boly, and S. Morgan. “Impact of Site-Scale Green Infrastructure on Volume Reduction in Combined Sewers.” World Environmental & Water Resources Congress Proceedings. Portland, OR. June 2014. Ostendorf, M., Retzlaff, W., Thompson, K., Woolbright, M., Morgan, S., and Celik, S., “Storm Water Runoff from Green Retaining Wall Systems”, Cities Alive 9th Annual Green Roof and Green Wall Conference Proceedings, Philadelphia, PA, November 29-December 3, 2011. Richter, L., W. Retzlaff, S. Morgan, and K. Luckett. 2009. Green roof storm water retention – getting to the weight of the matter. Conference Proceedings Seventh Annual Greening Rooftops for Sustainable Communities Conference Awards and Trade Show. Atlanta, GA, 3-5 June. 15 pp. Retzlaff, W., S. Ebbs., S. Alsup, S. Morgan, E. Woods, V. Jost, and K. Luckett. 2008. What is that running off my green roof? Conference Proceedings Sixth Annual Greening Rooftops for Sustainable Communities Conference Awards and Trade Show. Baltimore, MD, April 30 – May 2. 13 pp. Henderson, A., V. Jost, K. Luckett, S. Morgan, and W. Retzlaff. 2016. Evaluation of irrigation methods on Sedum spp. in established Midwestern green roofs. Poster at the 108th Annual Meeting of the Illinois State Academy of Science, SIUe, Edwardsville, IL, 15-16 Apr. Morgan, S., J. Zhou, B. Retzlaff, D. Wilson, R. Witt, and S. McCrary. “Public and Private Partnerships to Adopt Green Infrastructure for Managing Urban Stormwater.” 2016 International Low Impact Development Conference. Beijing, China. June 28, 2016 oral presentation. Zhou, J., S. Morgan, I. Al-Yaseri, and A. Bloorchian. “Field-scale Application and Performance Evaluation of Green Infrastructure for Stormwater Reduction in Combined Sewers.” 2016 International Low Impact Development Conference. Beijing, China. June 27, 2016 oral presentation. Morgan, S. “Quantity and Quality Impacts of the Rain Gardens.” U.S. Green Building Council Missouri Gateway Chapter. St. Louis, MO. March 11, 2015. Morgan, S. “Panel Discussion: Sustainable Water Infrastructure.” Linking Research and Practice Conference. St. Louis, MO. January 23, 2015. Mosby, K., W. Retzlaff, and D. Murphy. 2013. Storm water runoff of residential green roof systems. Oral presentation at the 105thIllinois State Academy of Science Annual Meeting, Illinois College, Jacksonville, IL, April 5-6. Palmisano, K., W. Retzlaff, and J. Sloan. 2013. Evaluation of drinking water residuals as an ingredient for green roof soil. Oral presentation at the NGRREC Internship Symposium, East Alton, IL, August 6. Celik, S., W. Retzlaff, and S. Morgan. 2013. Runoff from and thermal effects of green roofs. Oral presentation at the St. Louis Engineers’ Club Luncheon, St. Louis, November 12. Mosby, K., D. Murphy, S. Morgan, V. Jost, K. Luckett, and W. Retzlaff. 2012. Storm water runoff of residential green roof systems. Poster presentation at the 104th Annual Meeting of the Illinois State Academy of Science, Knox College, Galesberg IL, 30-31 April. Mosby, K., D. Murphy, S. Morgan, V. Jost, K. Luckett, and W. Retzlaff. 2012. Storm water runoff of residential green roof systems. Poster presentation at the Cities Alive 10th Annual Green Roof and Green Wall Conference, Chicago, IL, October 17-20. Morgan S., R. Cooper, and W. Retzlaff. 2012. Nitrate in green roof runoff. ASCE 5th National Low Impact Development Conference. November. Murphy. D., D. Jennings, S. Morgan, V. Jost, K. Luckett, and W. Retzlaff. 2011. Storm water runoff of green roof systems. Poster presentation at the 103rd Annual Meeting of the Illinois State Academy of Science, Eastern Illinois University, Charleston IL, 8-9 April. Jennings, D., D. Murphy, S. Celik, V. Jost, K. Luckett, and W. Retzlaff. 2011. Thermal flux of residential green roof systems. Poster presentation at the 103rd Annual Meeting of the Illinois State Academy of Science, Eastern Illinois University, Charleston IL, 8-9 April. Thompson, K., M. Woolbright, S. Morgan, S. Celik, and W. Retzlaff. 2011. Evaluating the storm water mitigation potential of living wall systems. Poster presentation at the 103rd Annual Meeting of the Illinois State Academy of Science, Eastern Illinois University, Charleston IL, 8-9 April. Cooper, R., S. Morgan, and W. Retzlaff. 2011. Nitrate in green roof runoff. Oral presentation at Philadelphia Low Impact Development Symposium, Greening the Urban Environment. Philadelphia, 25-28 Sept.
Ostendorf, M., W. Retzlaff, K. Thompson, M. Woolbright, S. Morgan, and S. Celik. 2011. Storm water runoff from green retaining wall systems. Oral presentation at Cities Alive 9th Annual Green Roof and Green Wall Conference. Philadelphia, PA. 29 Nov. – 3 Dec.
Hilligoss-Volkmann, E., V. Jost, K. Luckett, S. Morgan, S. Celik, and W. Retzlaff. 2010. Evaluating storm water runoff of green roofs with varying growth medium and species composition. Poster presentation at the 102nd Annual Meeting of the Illinois State Academy of Science, Millikin University, Decatur, Il. 9-10 April. Kelleher, J., V. Jost, K. Luckett, S. Morgan, S. Celik, and W. Retzlaff. 2010. Storm water retention of green roof models planted with mixed Sedum plugs. Poster presentation at the 102nd Annual Meeting of the Illinois State Academy of Science, Millikin University, Decatur, Il. 9-10 April. Richter, L., Retzlaff, W., Morgan, S., Jost, V., and Luckett, K. 2009. Stormwater loss through evapotranspiration from green roof systems. Oral Presentation at 101st Annual Meeting Illinois State Academy of Science, Edwardsville, IL. 17-18 April. Richter, L., W. Retzlaff, S. Morgan, and K. Luckett. 2009. Green roof storm water retention – getting to the weight of the matter. Oral Presentation at Seventh Annual Greening Rooftops for Sustainable Communities Conference Awards and Trade Show. Atlanta, GA, 3-5 June. Retzlaff, W., E. Woods, S. Morgan, and K. Luckett. 2009. Three years of green roof storm water retention evaluation. Poster at Seventh Annual Greening Rooftops for Sustainable Communities Conference Awards and Trade Show. Atlanta, GA, 3-5 June. Retzlaff, W., S. Ebbs, L. Battaglia, S. Alsup, S. Morgan, and K. Luckett. 2009. Green roof storm water runoff is not heavy (with metals). Poster at Seventh Annual Greening Rooftops for Sustainable Communities Conference Awards and Trade Show. Atlanta, GA, 3-5 June. Alsup, S., S. Ebbs, and W. Retzlaff. 2009. The exchangeability and leachability of metals from select green roof growth substrates. Oral presentation at 6th International Phytotechnologies Conference, St. Louis MO, 2-4 December. Morgan, S., I. Alyaseri, and W. Retzlaff. 2009. Suspended solids in and turbidity of runoff from green roofs. Oral presentation at 6th International Phytotechnologies Conference, St. Louis MO, 2-4 December. Alsup, S., S. Ebbs, and W. Retzlaff. 2009. Evaluation of metals in storm water runoff from select green roof systems. Poster at 6th International Phytotechnologies Conference, St. Louis MO, 2-4 December. Alyaseri, I., S. Morgan, and B. Retzlaff. “Solids in Stormwater Runoff due to Vegetated Growing Media in Green Roof.” Washington University. October 24, 2009. Alsup, S., S. Ebbs, L. Battaglia, E. Woods, K. Luckett, and W. Retzlaff. 2008. 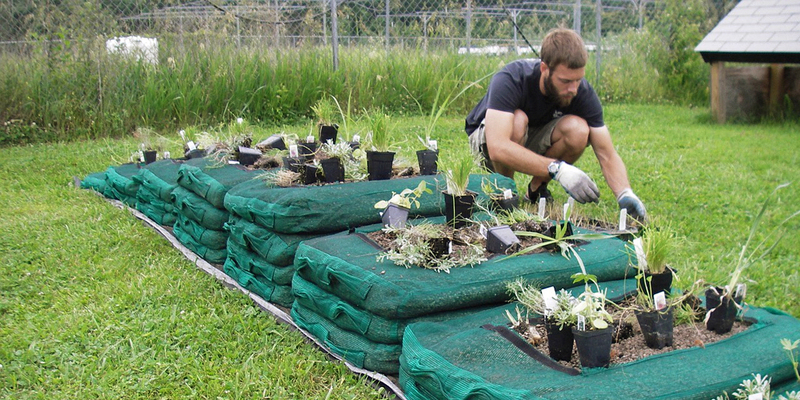 Evaluating storm water runoff quality from green roofs. Poster at 100th Annual Meeting Illinois State Academy of Science, Urbana-Champaign, IL. 4-5 April. Gaffney, D., S. Morgan, V. Jost, K. Luckett, and W. Retzlaff. 2008. Evaluating storm water runoff from green roof blocks with six different growth mediums. Oral Presentation at 100th Annual Meeting Illinois State Academy of Science, Urbana-Champaign, IL. 4-5 April. Woods, E., V. Jost, K. Luckett, S. Morgan, and W. Retzlaff. 2008. Evaluation of storm water runoff from green roof systems. Oral Presentation at 100th Annual Meeting Illinois State Academy of Science, Urbana-Champaign, IL. 4-5 April. Retzlaff, W., S. Ebbs. S. Alsup, S. Morgan, E. Woods, V. Jost, and K. Luckett. 2008. What is that running off my green roof? Oral Presentation at Sixth Annual Greening Rooftops for Sustainable Communities Conference Awards and Trade Show. Baltimore, MD, April 30 – May 2. Woods, E., V. Jost, K. Luckett, and W. Retzlaff. 2008. Evaluation of storm water runoff quantity from a green roof system. Poster at Sixth Annual Greening Rooftops for Sustainable Communities Conference Awards and Trade Show. Baltimore, MD, April 30 – May 2. Forrester, K., V. Jost, K. Luckett, S. Morgan, T. Yan, and W. Retzlaff. 2007. Evaluation of storm water runoff from a Midwest green roof system. Oral Presentation at 99th Annual Meeting Illinois State Academy of Science, Illinois State Museum and Lincoln Land Community College, April 20-21, 2007. Richter, L., W. Retzlaff, S. Morgan, V. Jost, and K. Luckett. 2007. Evaluation of storm water loss from a green roof system. Oral Presentation at 99th Annual Meeting Illinois State Academy of Science, Illinois State Museum and Lincoln Land Community College, April 20-21, 2007. Gaffney, D., V. Jost, K. Luckett, W. Retzlaff, and S. Morgan. 2007. Evaluating storm water runoff from Green Roof Blocks with six different growth mediums. 2007. Poster at 99th Annual Meeting Illinois State Academy of Science, Illinois State Museum and Lincoln Land Community College, April 20-21, 2007. Richey, D., K. Forrester, D. Gaffney, V. Jost, K. Luckett, S. Morgan, and W. Retzlaff. 2007. Evaluation of storm water quality from a Midwest green roof system. Poster at 99th Annual Meeting Illinois State Academy of Science, Illinois State Museum and Lincoln Land Community College, April 20-21, 2007. Retzlaff, W., S. Morgan, T. Yan, K. Forrester, S. Kaufman, J. Gibbs-Alley, H. Lucas, D. Gaffney, D. Richey, L. Richter, J. Gibbons, M. Sydow, H. Luckie, C. Hise, K. Risal, E. Woods, and L. Swearingin. 2007. Green roof storm water retention, growth media, and plant evaluations. Poster at Greening Rooftops for Sustainable Communities, Minneapolis, MN. April 29,30-May 1, 2007. Forrester, K., K. Luckett, V. Jost, S. Morgan, T. Yan, and W. Retzlaff. 2006. Evaluation of storm water runoff from a Midwest green roof system. Poster Presentation @ Illinois State Academy of Science, 98th annual meeting, April 20-22, 2006, University of Chicago, Chicago, IL. Bloorchian, A. A., J. Zhou, S. McCrary, R. Boly, and S. Morgan. Impact of Site-Scale Green Infrastructure on Volume Reduction in Combined Sewers. World Environmental & Water Resources Congress. Portland, OR. June 2014. McCrary, S., S. Morgan, J. Zhou, H. Pavitt, and A. Cairo. Inspiring Homeowners to Maintain Rain Gardens. World Environmental & Water Resources Congress. Portland, OR. Poster. June 2014. Ofori-Tettey, A., J. Eichhorst, and S. Morgan. Metals in Effluent from Bioretention Media Incorporating Bottom Ash. Low Impact Development Conference. St. Paul, MN. Poster. August 2013. Eichhorst, J., S. Morgan, and J. Hoskins. “Can Incinerator Bottom Ash Replace Sand in Bioretention Media?” World Environmental & Water Resources Congress. Cincinnati, OH. May 2013. Zhou, J., S. Morgan, D. Wilson, and S. McCrary. “Diverse Measures of Green Infrastructure for Combined Sewer Overflow Reduction in Metropolitan St. Louis.” World Environmental & Water Resources Congress. Cincinnati, OH. May 2013. Eichhorst, J. and A. Ofori-Tettey. Bioretention Media with Municipal Waste Incinerator Bottom Ash. St. Louis Earth Day Symposium. March 19, 2013. Ofori-Tettey, A., and S. Morgan. “Sustainable Bioretention Media Study.” SIUE. October 20, 2012. Morgan, S. M. “SIUE Rain Garden.” Erosion and Sediment Control Field Day. September 25, 2009. Invited. Eichhorst, J., and S. Morgan. “Sustainable Bioretention Media.” Shaw Professional Landscaping Series at Alberici: February 2012.